Filled with tournaments, ranked progression and a large variety of champions to keep its community grasped firmly in their clutches, League of Legends boasts its standing as the world’s biggest MOBA game out there. The game takes place in Runeterra, a world filled with wars of great magic that will either support your armies, or have them completely decimated. After the many wars, factions began to crumble as the world of Runeterra was drastically changing due to the magic that has scarred the landscape. To aid this problem, the greatest magicians of Valoran came together to create an organisation known as the League of Legends which would settle disputes in a controlled way. The way this was done, was to have 2 factions have a select number of summoners pick champions that would battle in the Fields of Justice (Small controlled landscapes that the champions would battle in.) Battles in the Fields of Justice would be won by taking the enemy factions nexus, all while there are defensive turrets and novice summoners summoning braindead minions to fight for victory. League of Legends is as most MOBA games go, you’re put into the Battle Arena after selecting from the variety of champions, Summoner spells, Masteries and Runes (Will cover on these later.) You buy a few starting items to help you through the early game and try to gain a lane advantage (There are three lanes, top, middle, bottom, and then there is the jungle) over your opponent. In battle you use the 4 abilities specific to a champion to either obliterate your enemy for a large sum of gold, kill opposing minions to collect a small but steady amount of gold or escape being disposed of yourself. On the subject of gold, League of Legends uses a system where you fight for gold, and the better you do, the more gold you can accumulate, which leads to you having more powerful items which in essence, makes it easier to do as said earlier, kill or escape. In the current meta (form that the game leads, usually changed or made by players.) The top laner builds a tank or bruiser type (Bruiser being fairly tanky while being able to dish out a lot of damage,) the middle laner builds more of an assassin or heavy magic damage type that is suited for getting rid of the enemy bottom laners ADC (Attack Damage Carry,) the main source of that teams damage output. The ADC supported by funnily enough, the Support, built around assisting its team rather than killing opponents, and finally the jungler, who is there to assist team members while collecting gold and objectives that will give them the edge over their opponents. 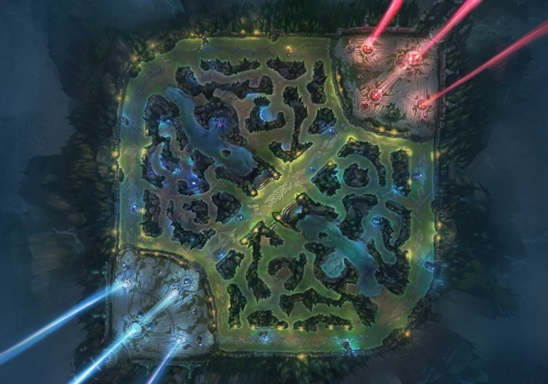 Once it reaches the ‘late-game’, this is where a massive amount of strategy kicks in, teams will fight each-other for the opposing nexus to win the game. This is usually done in the form of team fights, where 5 players will fight the 5 other players to keep them dead so they can reach the nexus for the win. Some enemy players down? Time for Baron! League of Legends is still a fairly old game, but the graphics, there’s just something about them that kind of makes me feel back to the days of Wind Waker. In my honest opinion it has fairly cartoonish style, but not so much like a kids cartoon, more of a comic book style to it, which I find to be rather appealing. It uses a large variety of colours, even some to help colour blind players (I tip my hat to you riot.) As for the sound, well there’s a lot I could say here (Like seriously a lot, I’d have to go over so many Champions,) but to keep it short and sweet, the music doesn’t really appeal to me, I’d rather have some of my J-Rock going on in the background. However, I do like a lot of the voice actors for the game, especially Riven’s (I had to mention her, favorite Champion after all.) Overall I think the graphics should, or at-least could be updated. Now this is where things start to become sinister. As nice as it is to play League of Legends, I’d much rather play it with a group of 5 friends than actually go into a solo queue? Why you ask, because the community of this game is absolutely horrible. Don’t get me wrong, there are some real cool people that play the game (I still have a few added to my friends list,) but the other 75% are flamers, cursers and trolls (I’m not even over-exaggerating this one.) Trying to get up in the ranks and make your climb out of Bronze and Silver Division is one of the most frustrating things I have ever done simply because of the community. I cannot urge how much this has a big fall for the game, and Riot have tried many things to reduce the numbers, but it’s like they never stop. And this one thing had to be mentioned, because it does make a large impact on the game itself. Thankfully RiotGames has been on top of the issue and has been removing / banning those players that are deemed toxic and have been driving away potential players who simply don’t want to be harassed while learning the game. While this has done some good in the form of damage control, the game it’s self is still viewed as a second alternative to a more decent competition, Blizzard’s DotA 2, who’s community is perhaps a slightly more tolerant. So who went and flamed Amumu? The game in itself is fun, especially when you’re able to grab a few friends and set up strategies to destroy your opposition. The game-play and controls are fairly easy to understand and there’s such a large variety of champions you won’t get bored in a long time. But the crushing factor of this game is its abusive community and this is why I would recommend this game only to those who seek fun or can ignore the curses of the many trolls in the Fields of Justice.